Heat oven to 350°F. Grease a 9-inch pie plate. 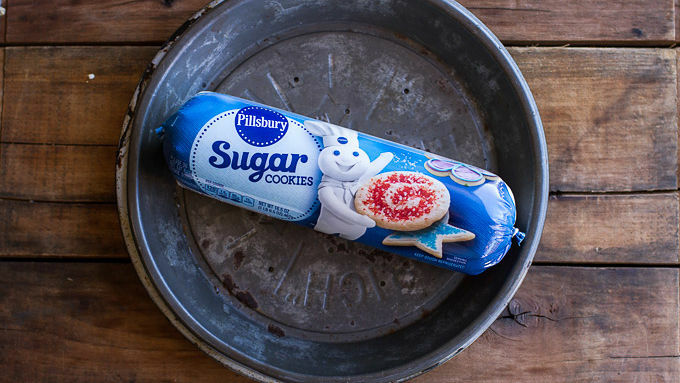 Unwrap the sugar cookie dough and break it into pieces. 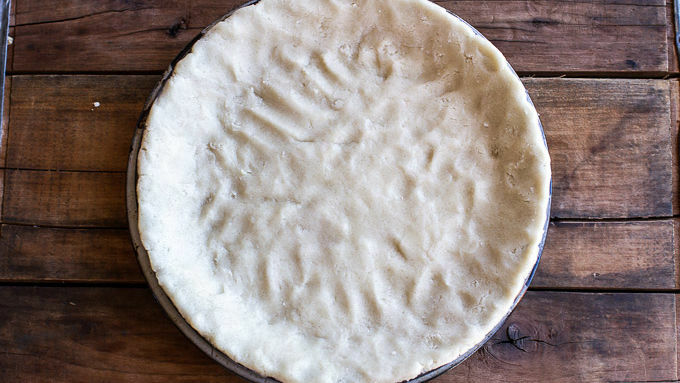 Push the dough into the greased pie plate until it covers the entire plate and sides like normal pie dough would. Try to make it one even layer. Cover the pie plate and place it in fridge while you make the filling. 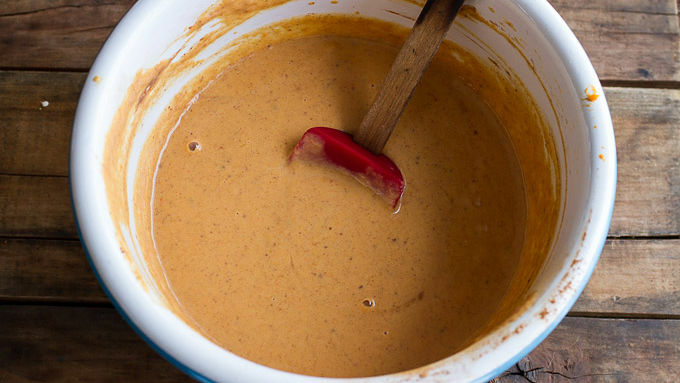 In a large bowl, whisk the pumpkin, sweetened condensed milk, eggs, cinnamon, ginger, nutmeg, salt and vanilla until smooth. Reserve 1 cup of the filling and pour the remainder into the chilled crust. Place the Nutella® in a microwave-safe bowl and microwave for 30-second intervals, stirring in between, until the chocolate spread is pourable. 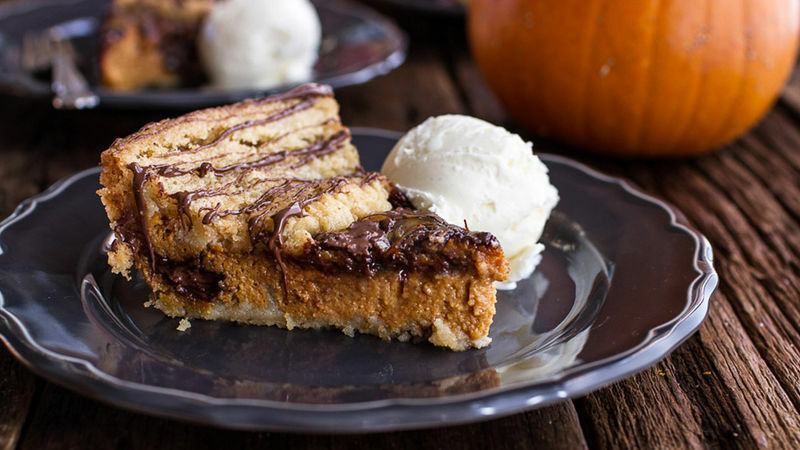 Drizzle about half the Nutella over the pumpkin pie. Use a knife to swirl the Nutella® into the pumpkin mixture. Then pour the reserved pumpkin pie filling on top of the Nutella-swirled filling. Finally, add the remaining Nutella and swirl again with a knife. Bake for about 45-50 minutes or until the filling is set. The center may still look wet, but if the pie only jiggles just a little, it’s done. If the sugar cookie crust is getting too brown before the filling is fully cooked, cover the pie with foil. Allow the pie to cool completely before cutting. Store, covered, in the fridge. To serve, bring the pie to room temperature and serve with whipped cream or ice cream and a drizzle of Nutella®. The pie can be stored in the fridge for up to 4 days prior to serving. Bring the pie to room temperature before serving. Refrigerated chocolate chip or gingerbread dough can be substituted for the sugar cookie dough. 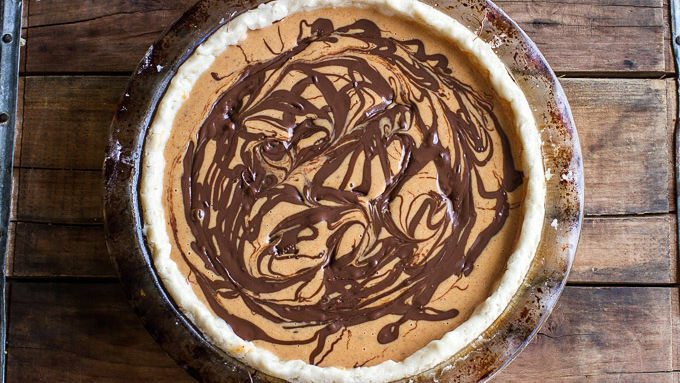 You're going to love this fun twist on the classic pumpkin pie. You know what makes traditional pumpkin pie even better? Nutella® swirl ... and a sugar cookie crust! See, doesn’t that sound better than boring old pumpkin pie with zero chocolate and a crust just like every other pie? It sure does. I think almost all desserts should have at least a little chocolate. Chocolate just equals dessert, which equals extraordinary! Until recently I had never actually made a pumpkin pie. This fall, though, I wanted to make a real pumpkin pie. BUT I knew that – considering my family – I had to throw in some chocolate. While I was changing things around, I thought maybe a sugar cookie crust would be kind of fun too. The sugar cookie crust has me so excited. 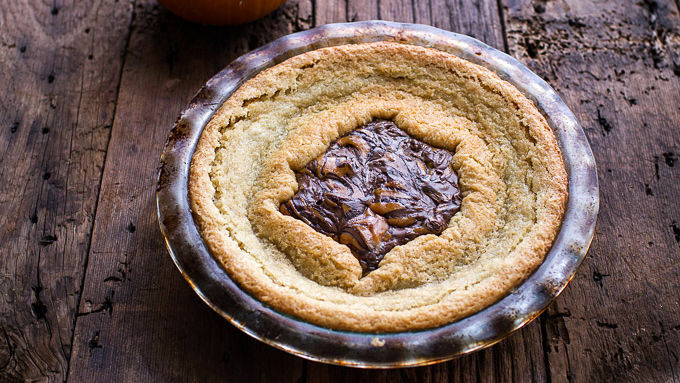 It’s like a deep-dish pie encasing a pumpkin AND chocolate lover's dream. Perfect combo! To serve, bring the pie to room temperature and serve with whipped cream or ice cream. Drizzle with Nutella® ... and devour. Store leftovers in the fridge – if you have any leftovers! The pie can be stored in the fridge for up to 4 days prior to serving. Bring the pie to room temperature before serving. Refrigerated chocolate chip or gingerbread dough can be substituted for the sugar cookie dough.